KKR vs CSK, Head-to-Head Record: Ahead of IPL 2019 Clash, Here Are Match Results of Last 5 Kolkata Knight Riders vs Chennai Super Kings Encounters! Kolkata Knight Riders are looking to get back to winning ways with a win over title favourites Chennai Super Kings at home. Their last home game which was against Delhi Capitals did not go as per plan as they had no answer to the heroics of Shikhar Dhawan. With doubts over the availability of key man Andre Russell for the crunch tie, they are in danger of losing twice to Chennai in a season. Just a few days ago there batting collapsed on a spinner friendly M A Chidambaram track gifting the match to the hosts. In terms of head to head contest-the two teams have played 22 games with Chennai winning 13, Kolkata 8 and 1 game had to be abandoned. A look back at how these franchises performed in the last five games. Kolkata Knight Riders vs Chennai Super Kings Live Cricket Score. The Chennai bowlers led by Deepak Chahar showed their class as the visiting Kolkata batsmen seemed clueless batting first. Spinners Harbhajan Singh and Imran Tahir picked up a brace each to restrict KKR to 108/9. The Chennai reply was slow but they reached their target in the end with seven wickets to spare. Mahendra Singh Dhoni scored a 25 ball 43 that included 4 huge sixes to help propel Chennai Super Kings to 177/5 in their quota of twenty overs. The other top order batsmen also got starts for Chennai but none of them converted it to a big score that would have enabled Chennai go past double century. Shubman Gill hit a fine half-century for Kolkata as they romped to a six-wicket win. No End to Funny RCB Memes Despite Virat Kohli and Co’s First Win of the IPL 2019. Andre Russell’s 36-ball 88 went in vain as Chennai Super Kings chased down a huge score of 203 to script a memorable win. The West Indies all-rounders breathtaking innings included 11 sixes but it was matched by a collective effort from the home team with Sam Billings top scoring with 56. Vinay Kumar gave away 35 runs in 11 balls to cap a day to forget for the KKR bowling unit. Veteran spinner Brad Hogg picked up 4 wickets to put Chennai under immense pressure in the middle period of their innings. Pavan Negi and Ravindra Jadeja did score a few runs in the lower order to help CSK finish with 165/9. But the dew factor kicked in the second innings with Robin Uthappa fully capitalizing on it. His unbeaten 80 runs meant Kolkata registered an easy seven-wicket victory. 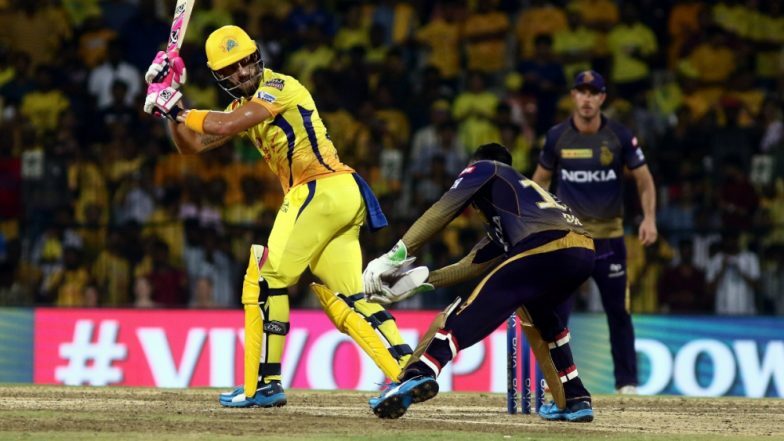 IPL 2019: Chennai Super Kings Batting Coach Mike Hussey Says 'Team Has Moved on From MS Dhoni Outburst' in Match Against RR. Chennai’s excellent fielding and bowling helped them defend a low target of 135 as the fans in Chepauk were treated to a gem of a game. Dwayne Bravo was adjudged the man of the match for his three wickets but Ravi Ashwin’s brace was equally important in the victory. The toss is going to play a crucial role in the game between Chennai and Kolkata with the side batting second certain to dominate.